Arjun Ram is interested in animal testing of compounds with potential anti-asthmatic applications. 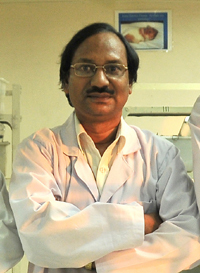 He has carried out a series of studies on airway hyperresponsiveness and inflammation, in a mouse model of asthma, using synthetic and natural compounds, notably curcumin. He is also in-charge of the animal facility of IGIB and provides valuable support in the activities of the animal ethics committee at IGIB besides pursuing his research interests in asthma. Inhaled carbenoxolone prevents allergic airway inflammation and airway hyperreactivity in a mouse model of asthma. Ram, A., Singh, S. K., Singh, V. P., Kumar, S., and Ghosh, B. Int.Arch.Allergy Immunol. 2009. 149, 38-46. Mepacrine alleviates airway hyperresponsiveness and airway inflammation in a mouse model of asthma. Ram, A., Mabalirajan, U., Singh, S. K., Singh, V. P., and Ghosh, B. Int.Immunopharmacol. 2008. 8, 893-899. Glycyrrhizin alleviates experimental allergic asthma in mice. Ram, A., Mabalirajan, U., Das, M., Bhattacharya, I., Dinda, A. K., Gangal, S. V., and Ghosh, B. Int.Immunopharmacol. 2006. 6, 1468-1477. Luteolin alleviates bronchoconstriction and airway hyperreactivity in ovalbumin sensitized mice. Das, M., Ram, A., and Ghosh, B. Inflamm.Res. 2003. 52, 101-106.